I had a recent trip to Singapore & Malaysia so thought to give a try to Indusind Forex card which is by far the best in market for now. 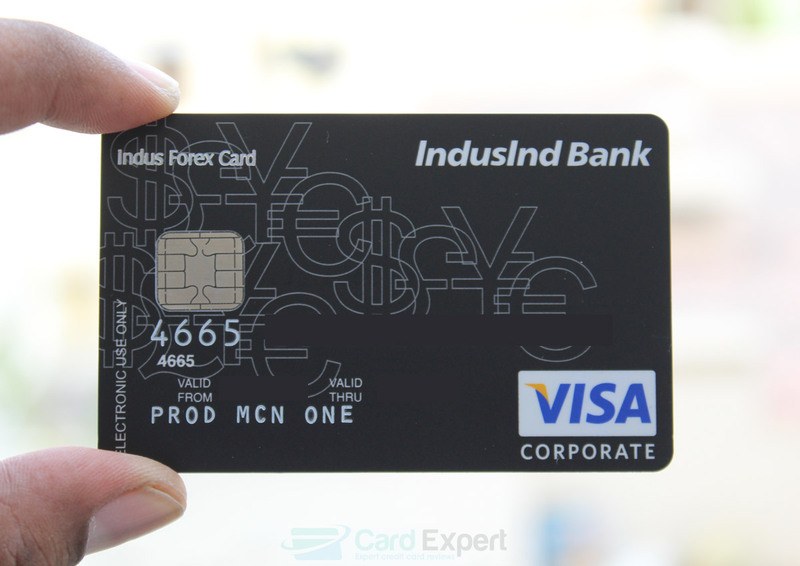 I have Indusind Exclusive Signature DEBIT card which serves all the international transaction purposes, but I took this IndusForex card just to experience how the forex card works, as there is quite a noise for Forex cards in the country. Day 1: Applied online for 100 SGD (minimum) with a coupon code: CARD150 so the card issuance fee gets waived off. Day 2: Opted for Branch delivery though received the instant kit delivered at home (exclusive banking benefit) after submitting the documents (flights & Visa) and the card was activated the same day. The rates are in par with Xe.com values with minor difference, as bank’s BUY rate differs from actual worldwide conversion rate. Additional Savings: While you can pay for the above using net banking, fortunately, you can also pay using a Visa/MC credit/debit card. However it comes with ~2% extra fee which i opted for and paid with my HDFC Jet Privilege World Credit Card. Doing so, i need to pay ~Rs.100 extra but i get ~200 JP Miles which means i’m technically buying 1 JP Mile for 50 paise. It makes sense to me as i try my best to get a value of Rs.1 for 1 JPMile. If you transact in a currency that’s different from base currency, you’ll be charged 3.5% markup fee. Hence, this card is good only if you can spend in the currencies that they offer. They do address verification. I applied using Aadhaar OTP and they verified my permanent address as on Aadhaar after ~2 weeks when i was actually back from the Trip. I didn’t apply using my existing ac info as it pulled the data with some errors. 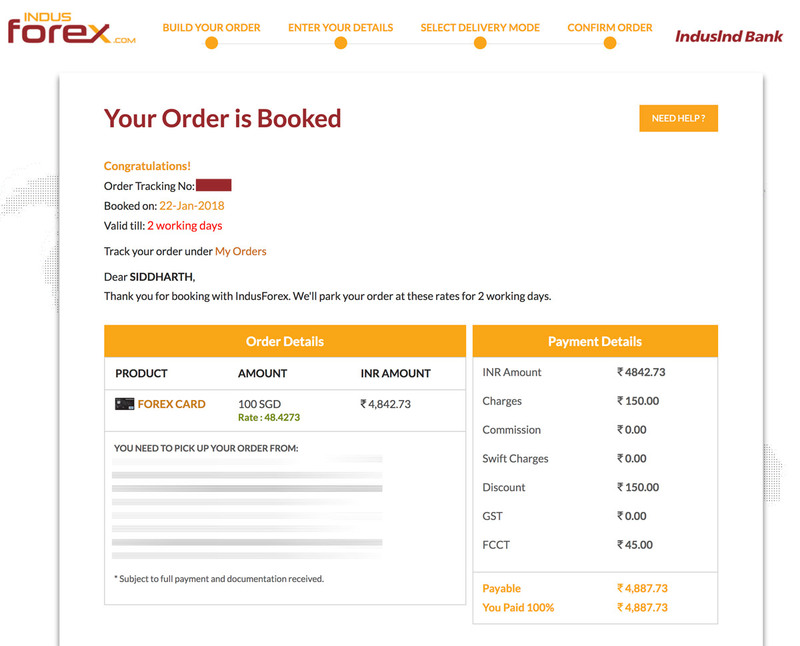 Indusind Bank does a great job when it comes to markup fees on international transactions. Even-though AxisBank seems to own a high market share in the segment with their not so great offerings, i believe its only a matter of time for Indusind to lead. On the product side, i’m extremely happy with the booking process, delivery, activation and the ease of usage. Have you ever opted for an Indusind Multi-currency Forex Card? Feel free to share your thoughts in comments below. Isen’t your ICICI Sapphiro Visa / Amex give better JP rate reward (7) on international translations. Especially when you already are paying 2%. their Visa card is giving 2X as well currently. Diners black seems useless for carrying internationally (Except Lounges 🙂 ) – its now 9 months and about 9 international trips my DCB still awaits first PoS acceptance. As i said, its just an attempt to try Forex cards and will be useful for others who’re not having the cards i hold. P.S. Diners acceptance in Singapore is somewhat okay. Amex is accepted everywhere and yes i’ve been using Amex jet Sapphiro quite often that the statement is as long as 10 pages, due to huge markupfee & gst records on each txn. Did you compare it with spends on IndusInd Exclusive Visa Signature Debit card? In spends with IndusInd Debit Card, you also get points for the spends. So, if you factor that into the equation, is it prudent to take a forex card at all? 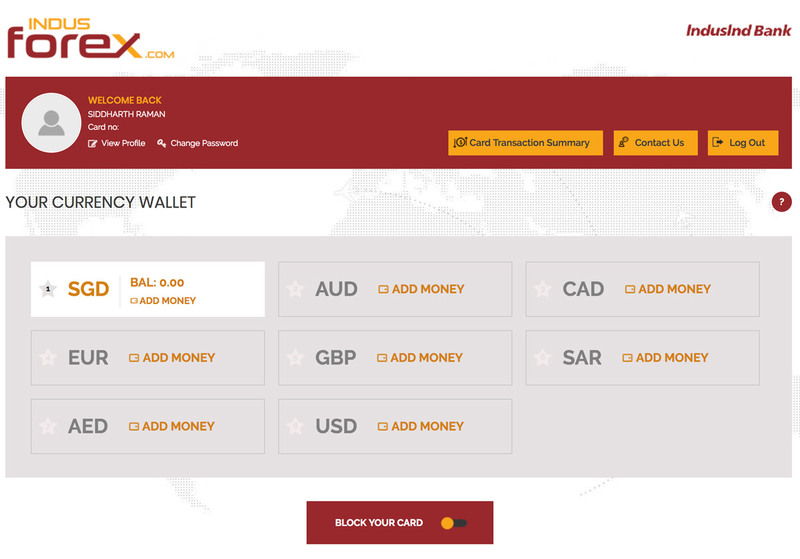 With a Forex card, you can maximum save the Mark Up fees that you are charged on your Credit/Debit cards. One more advantage of the Debit Card is that you don’t have to pre-fill the currency. You can go on spending in any currency you want. So, I find the IndusInd Visa Exclusive Debit Card Very good. So What is your suggestion regarding Indus Forex Card or Indus Debit Card? Though, as the exclusive a/c balance requirement is high, if someone without Indusind Ac needs Forex card, this would be the best choice i would say. On a contrary note, I prefer forex card over debit card since it allows me to earn 6% interest rate on my savings bank account (kotak) vs 4% at indusind. But is it safe using debit cards internationally on POS machines ?? How do you get 1 rs value of jp miles? Any other way other than last minute tickets? P.S. There are many other ways as well. Check out Jet Airways business Class article and its comments for more info. I recently used Bookmyforex Axis bank multicurrency card on my trip to HongKong. The first 3 withdrawal were free. Had some HKD left, the refund process was very simple. One has to place a request on Bookmyforex website, they send a form fill and scan it the money will come in your account. One more thing i loaded the card with my credit card, i was charged 2%. So in essence not much difference between Indusind and Axis. What is the validity of the card ? Lets Say if we have one foreign trip in each year for the next five years, will one card be valid for all that time. Can I buy on the amazon.com or other website to exhaust the foreign exchange if required? Its 3 yrs, updated the article as well. Yes, you can use the gift card on any online portal. Diners black cc has mark up fees of just 2% and it gives 10X points on international spends too. So ain’t it the best of all cards to use it internationally. Actual savings of 33-2% =31% which no card offers. Capping of 10000 points though. It is. But the acceptance is the major issue, especially on POS when you’re on Intl trip. I would safely say acceptance is 10% in foreign countries, at-least in SE Asia. Maybe better in western countries. When you have YFE with low markup fee then why should you go for this forex card ? Among YFE CC and Forex card ,Which is the better option to use while travelling abroad ? YFE is good enough. But forex card (or debit card) is required when you want to withdraw money. So you need a combination of both. Sid, I think you had a smooth experience. I, on the other hand have had a far from satisfactory experience so far. Booked the card on Wednesday evening, and did not receive even a confirmation mail. I called customer support to be told that the card would be ready to be collected from the branch on Thursday evening. I did not receive any call or mail until Thursday evening, and tried calling the mobile number listed on the confirmation page. Turns out, the number does not even belong to an Indusind employee. Called support again to get the correct mobile number. Called and was told that they just received the order and that they were out of stock of cards. I also got a confirmation to collect the card on Friday at 2 PM. Coming to Friday, I get a call at 12.30 PM saying we still do not have cards available across branches in Bangalore, and that they had no idea when this would be available by. I decided I had had enough and called the customer support at 1.30 PM to cancel my order. They were clueless, and unable to connect to their own branch. A marathon 50 minute call later (where I gave them their branch number), they said they are again going to try and confirm within 30 minutes. I then get a call at 3.30 promising the same thing again. I am still not sure what is happening. They are not even allowing me to cancel the order !! That’s really sad. Thing is, you should never call phone support guys as this process is more on branch side. The branch that you select gets the order email and it has to be processed by branch guys only. Its good to check the stock with branch (via RM) before ordering. Do try checking with social media team as they can reach out to BM to speed up things. I was not aware of this and did not expect them to mess up so bad. However, one post on social media set the wheels turning. 4-5 different guys called me and arranged the card. The card is on the way now. Hopefully gets activated by tomorrow. What was concerning was that the number on the order confirmation page did not even belong to the bank. Yes, it happens. It might have shown the old branch numbers on system and i see it happen with many banks that change the numbers but not mind to update it on system or even on maps. Based on your review, I booked the Indusind forex card online. They also delivered the card to my home in 3 days flat! I had a superb experience with them. Also, once I do this, i can reload the card online itself. Have given one to my son and whenever he needs cash, i just load the card. No need to do a fund transfer to his local account and pay hefty fees etc..
How do you pay remaining 95% amount via payment gateway if requested amount is huge (say $10000)? The FAQ mentions that it has to be paid within 24 hours via RGTS/NEFT etc. However, I doubt whether banks allow such high value money transfer to newly added payee in first 24 hours. How is it even possible without visiting branch? Even if I visit branch and submit RTGS form, I suspect it has to go through a lot of scrutiny if I visit a non-home branch. Yes, $10k is high, but it should be fine as its acceptable for a intl trip and not too much to get into scrutiny. You’ll get a call for some high value RTGS txn’s but should move the same day, on time. A quick call to RM or branch manager before doing such high value txns would help. Can you reload this card online ? Most of the forex cards can be reloaded only in branches and if someone else back home need to reload, I need to give an authorization letter etc and all those formalities. BookMyforex also offers a free card which has no issue fee, no reload fee etc but only first three transaction free in total. Indusind provides two free per currency per month. So confused between these two.. Any suggestions ? I’ll not recommend Indus Forex card thought they have wonderful features which may look very promising but it’s availability has a big ambiguity, my experience was really bad the website is not that reliable and I suffered due to that and I was unable to load the amount to the card during my trip in May 2018. I’m May the site was unavailable for 14 continuous days. They did offered me offline channel that was I come back to India and load the card or ask my friend or family to load the card, as it was suppose to be online hence I never gave the consent A2 form to anyone. So in both the cases offline channel was worthless to me. Without the consent form if the card is loaded that is a part of money laundering and probably they accept that as per the Customer Care. There is a big time ambiguity and if you are reading this then pay for Forex and get it when you want or you may suffer as me & my 6 year old and 9 year old suffered during holidays. I am a student i need a forex card for canada . Can i please suggest me best card with low conersion charges. I got the indus forex card yesterday. I can’t able to signup, getting error while login to the account. Looks like there is some technical issue. I applied on line today wirh card150 discount . paid gst45 and 25rs as netbanking charges for loading thai baht whose exchange matched almost exactly with xe. received catd today itself at bank. my question is that bank claims 0 fees for 2 atm withdrawal. but a friend of mine tells me that the bank of the atm will charge heavily. Can you clear the air as to which banks atm should i use in thailand to avoid any fees. Yes ATM fee is high in bangkok: ~400 Rs per withdrawal. Check what i was charged. Both cases i got free issuance of cards. HDFC 10x points make it better to buy from hdfc uptill 18000 Inr after that paying by netbanking on indusind is better. Pros of HDFC: More Currency that you can load. With make my trip variant you can get lounge access too. Pros of Indusind: Dynamic market rate, you can make use of sudden market plunges for foreign currency like Brexit i am hoping for. Cash withdrawl free twice a month per currency. All in all i suggest to keep both. Add monthly on HDFC before your planned travel to make use of cashbacks. Having two card insure you in case of losing one and Indusind can help you with cash withdrawal at airports like Dubai/Abu dhabi and maybe others where ATM disburse EUR/USD too especially when those Currency are not available in your card. So I am facing an issue with the card. They do not seem to have stock in the branch that I was to pick up the card from. On top of that the IndusInd team is not willing to share the date and time of when the card will be available. Have to travel next week so fingers crossed that I get the card by then.